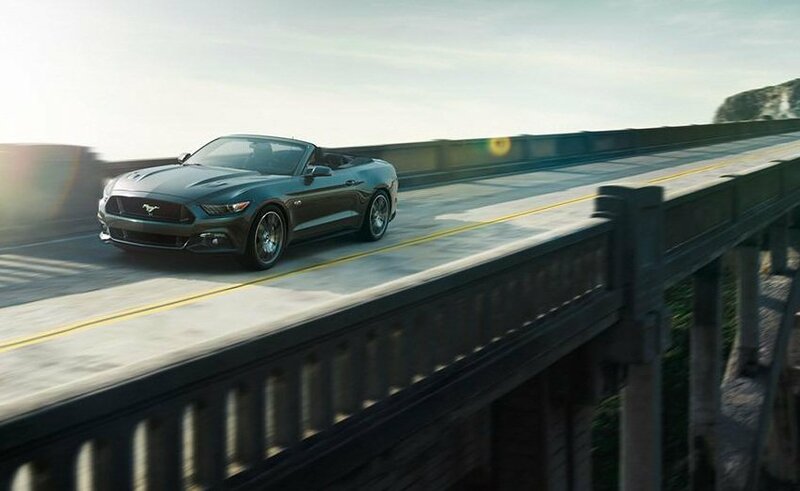 See our beautiful selection of Convertible Ford Mustangs, San Francisco Bay Area, CA. Identified as one of the best convertible cars of the year, by several auto authorities, the 2015 convertible Ford Mustang continues to outrank the competition. Although this news comes as no surprise, we are thrilled to hear experts agree that this classic Ford is still on top. Selected as one of two best convertible muscle cars, the Mustang made the Editor’s Choice: Best Coupes and Convertibles of 2015 in Car and Driver. Kelly Blue Book recently published a list of top consumer rated convertibles in which the Mustang received a 9.4 rating out of a possible 10. According to the KBB consumer ratings, the Mustang outranked many popular convertibles, including the 2015 Jaguar F-Type, Mazda MX-5 Miata, MINI and Nissan 370Z. Edmunds.com also classified the new Mustang as a top recommended convertible. They cited the vehicle’s high-quality interior materials, better sight lines and new independent rear suspension that delivers a better ride and handling compared to other models. Towne Ford is proud to offer a wide selection of new 2015 Ford Mustang convertibles for sale or lease. We can’t think of a better way to enjoy the beautiful California weather than to take a long drive with the top down. Why not come test drive a convertible Ford Mustang near San Francisco, CA soon.